Sisig is a popular Filipino dish found all over the Philippines and anywhere in the world wherever there are Filipinos. I am grateful for the opportunity to visit the birth place of modern sisig during the 15 Hour Food Frenzy Safari in conjunction with the WSFC World Street Food Congress 2016. The 15 Hour Food Frenzy Safari took us to Angeles City in the Philippines' Pampanga province (two hours drive north from Manila) in search of the birthplace of this iconic Filipino dish. Aling Lucing's stall is credited to be the birthplace of the modern form of sisig. Aling Lucing created her sisig in 1974, using pig heads discarded by the kitchen at the nearby American Clark Air Base. Aling Lucing's creation was a phenomenal success and sisig shops sprung up all over the Philippines, not to mention countless home kitchens. Sadly, Aling Lucing met an untimely tragic death in 2008 at the hands of robbers who killed her in her sleep during a botched robbery. The case was never solved and the robbers never caught. To this day, Aling Lucing's legacy lives on in her sisig. At Aling Lucing's shop, sisig is still made with meat, fat and skin carved from pig's head and jowl. The pig's face is boiled, marinaded with vinegar and calamansi juice, then grilled over charcoal to a slight crisp, chopped into small cubes, mixed with chopped raw onion and mashed boiled chicken liver, sauteed with margarine and served sizzling hot on a cast iron plate. Aling Lucing's dish is a sizzling jumble of meat, fat, skin, cartilage and onion, steaming and spattering greasy bits as we poked our forks into the oily pile. The texture is a mix of soft and gummy fat and meat, slight crisp from skin and juicy crunch from the chopped onion. The flavour is robust with savouriness and sourness dominant. There is also a slight sweetness and raw taste from the chopped onion. The strong flavours went well with simple plain white rice (heaps of it). 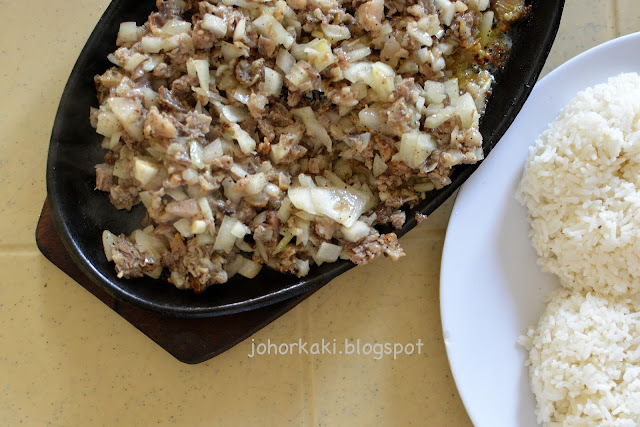 Inexpensive, substantial, filling and highly palatable, sisig quickly became a popular, energy giving staple meal (whereas it was just an appetising snack during the Spanish era). This cholesterol saturated dish is 5-star - food that I am willing to die a little for. Aling Lucing Sisig was one of the food stops of the 15 Hour Food Frenzy Safari curated by Makansutra and OurAwesomePlanet in conjunction with WSFC16 World Street Food Congress 2016 in Manila (from 20 to 24 Apr 2016). Whoo! the home of the famous sisig! Thanks for sharing.